Looking for Renaissance and Celtic jewelry? Then you have come to the right place! Just browse through our truly unique selection of jewelry. 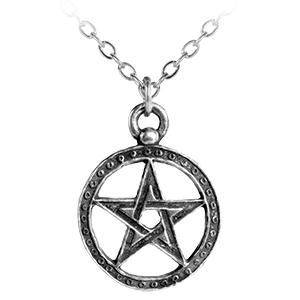 Here you will find medieval jewelry, Celtic jewelry, gothic jewelry, Wiccan jewelry, and Pirate jewelry, as well as fantasy jewelry. Jewelry was a very big part of a persons wardrobe in medieval times, as it signified your status. The larger and nicer your jewelry was, the higher in class you were. We offer a great selection of jewelry offered at very competitive prices. Anyone can afford to look like a noble. Select from the categories below to view our extensive collection, and you will find necklaces, pendants, brooches, bracelets, earrings, chokers, rings, and even hair pieces. 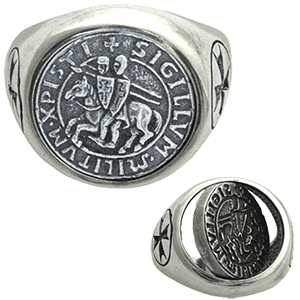 Much of our themed jewelry also goes great with both medieval and modern day wear. 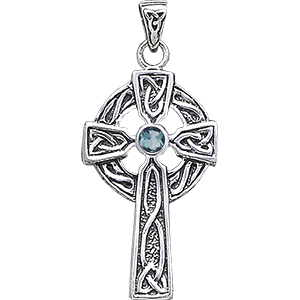 Celtic jewelry is mostly well known for the gorgeous Celtic knotwork that is displayed on each piece. You can wear our Celtic jewelry with your medieval and Celtic outfits at the Renaissance fair, or you can even wear it with your everyday outfits. Aside from knotwork, we also have jewelry piece featuring Celtic crosses, Celtic dragons and serpents, and the Celtic Claddagh symbol. Our Celtic jewelry section consists of Celtic necklaces, Celtic rings, Celtic bracelets, Celtic pendants, Celtic earrings, and Celtic brooches. For the Celts, life was seen as a riddle, the "eternal journey", so to say. They believed in reincarnation: continuous rebirth until complete spiritual rebirth was achieved. These knots symbolized their maze through eternity, and their understanding of various spiritual levels in the search for purification of the soul. The cross symbolizes the bridge to other worlds and to higher energy and knowledge. This is realized by the vertical axis, or celestial world, and horizontal axis, representing the earthly world. They are also considered solar symbols, sources of light and ultimate energy. The design of the heart held between two hands with a crown set on top is known as the Claddagh, and was reputed to originate in the Irish village of Claddagh, across from Galway. Traditionally used as a ring, it was a family heirloom handed down as an engagement ring, token of friendship, or wedding ring. The symbolism is as such, heart as love, hands as friendship, and crown as fidelity. We have the perfect piece of medieval jewelry for any occasion! We offer a very selective line of high quality sterling silver and pewter jewelry that will be the perfect accent to your outfit. Whether you are dressing as a peasant and looking for a simple, understated charm or necklace, or a noble who is looking for that top quality piece that is going to turn heads as you walk about the fair or royal ball. We offer medieval and Renaissance style necklaces, brooches, earrings, pendants, charms, rings, and bracelets. Our medieval and Renaissance Jewelry features classic styles with simulated jewels, antique finishes, and popular medieval symbols like fleur-de-lis, rampant lions, and dragons. 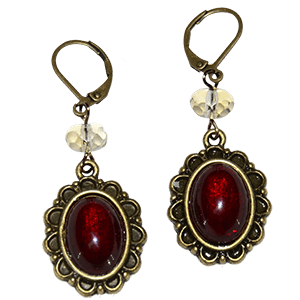 We have medieval and Renaissance jewelry that is suitable for men, women and children. We are striving to be one of the best places for shopping online for your favorite Gothic jewelry. 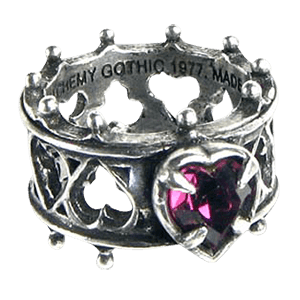 Our Gothic jewelry is well made and mostly crafted from fine pewter, unless otherwise stated. We offer a large selection to choose from, so please take some time and browse through our categories! We have accessories, gothic bracelets, gothic chokers, gothic earrings, gothic watches, gothic pendants and gothic rings. A large part of the gothic jewelry we carry is made in Sheffield, England. These unique jewelry pieces make great gifts for yourself or someone else! Wear our gothic jewelry with gothic clothing, gothic costumes, or even with everyday looks. Our fantasy jewelry section is filled with an assortment of themed jewelry that does not quite fall under any of our other themes. 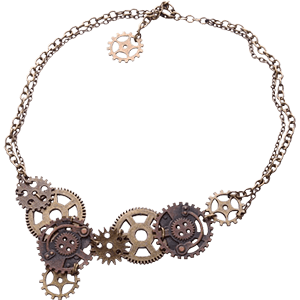 Some of it touches gently on other categories, like necklaces that could be somewhat gothic or pendants that are slightly pirate-y, or any number of some of our fantasy-themed pieces of jewelry that are great for barbarians of all kinds. But really, none of our fantasy jewelry falls as precisely into any of our other categories; instead, they sit neatly in the realm of fantasy, which can draw inspiration from anywhere and everywhere, including any number of our already-existing categories. The end-result is that our fantasy jewelry section is filled with items that are fantastic and exquisite in nature, with just a touch of that unrealistic sense that fixates them perfectly into the realm of fantasy jewelry. So if you are looking for some fantasy-themed jewelry, sit back, kick your feet up, and take some time to browse through our fantasy jewelry section. Not only will you find a number of pieces of themed fantasy jewelry, but you will also find such intriguing items as neck-knives, and even a few pieces based on memorable fantasy characters, like Conan the Barbarian. Arr Matey! When one is sailing the High Seas, make sure you have the best accessories, like our cool Pirate themed necklaces, pendants, earrings and rings, as well as other nautical themed jewelry pieces! Whether you wear them around every day or only to the pirate festivals, you are sure to get compliments on these unique pieces of jewelry. 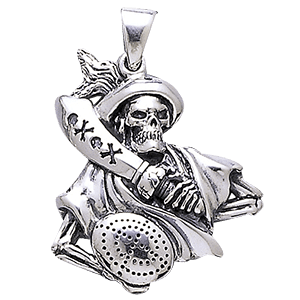 Our pirate jewelry is made of quality sterling silver or pewter. Pirate jewelry will add the perfect touch to your pirate outfit or garb. Known for their fierce warriors and advanced longships, seafaring Vikings left traces of their mythology and Nordic culture throughout Europe and Asia from their many raids and settlements. 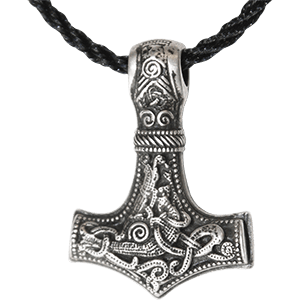 Here we offer an assortment of Viking-inspired jewelry for men and women, including Viking necklaces, Viking pendants, Viking rings, Viking wristwear, Viking earrings, and Viking charms. 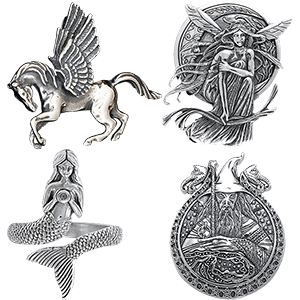 Many of these pieces feature mythological elements of Thor, Odin, Freya, the Valkyrie, and more. Others show off the striking look of Norse runes and knots or designs based on Viking shields, Viking axes, Viking ships, and so forth. 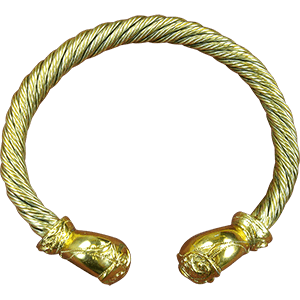 Whether you want the perfect piece to finish off a historical costume or simply enjoy the look of these striking Viking accessories with your daily attire, you can find what you are looking for here in the Viking jewelry category! The Greek and Roman Empires remain some of the most important and powerful civilizations to have ever existed. Now you can dress with impressive Grecian or Roman style with the help of our Greek and Roman jewelry. We carry a variety of Roman and Grecian accessories to help set off your look, crafted from fine materials like gold, pewter, leather, beads, and faux gemstones. Browse to find a number of Greek and Roman pendants and necklaces, earrings, bracelets and torcs, rings, and more. Many of these pieces feature Greek or Roman icons and motifs such as owls, dolphins, laurels, coins, and many others. These excellent pieces of Roman and Greek jewelry make the perfect finishing touch for anyone dressing as a gladiator, Greek orator, or decadent Roman citizen. Our Victorian jewelry is named for an era in British history when Queen Victoria ruled and England experienced a time of great growth and prestige. And here we offer a great range of beautiful pieces of jewelry, all recreated according to the fashions of the Victorian era for you to browse and enjoy at your leisure. Like the fashion of the era, most Victorian jewelry has something of a timeless quality to it, possessing a beauty that remains elegant and attractive even by modern-day standards. Perhaps the most famous example of Victorian jewelry is the cameo. This style of carving was a personal favorite of Queen Victoria herself, and it has quickly become commonly associated with Victorian era jewelry. Here, you will find all the rings, amulets, pendants, bracelets, and other pieces of jewelry, some done in cameo style and others left simply Victorian in look. Each accessory you find here is a stunning example of Victorian jewelry at its finest, so much so that you can wear them as a part of a costume if you desire, or you can just add them to your collection and wear them whenever you want, with contemporary styles. We pride ourselves on our ability to provide not only historic jewelry, but also historic jewelry that looks just as great now as it did then, and that is just what you will find here in this Victorian jewelry category. Show off your favorite fandom in style with our selection of pop culture jewelry! 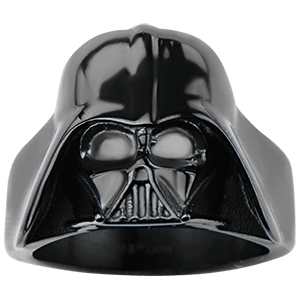 We carry a wide range of jewelry types for a great variety of franchises, like Game of Thrones, Lord of the Rings, Vikings, Harry Potter, and more, as well as comic book and video game jewelry. Shop pop culture necklaces and pendants as well as pop culture anklets, earrings, and other body jewelry in this category. We also offer a selection of pop culture hair accessories to help take your look to the next level, whether you are looking for an everyday way to represent your favorite show, movie, or game, or dressing up for a convention.